Model 1650 — The Feedall line of thru-feed conveyors offer infeed and exit capabilities for complete automated shaft feed systems. 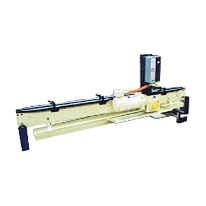 Model 1650 features conveyor lengths of 62 1/2” and 72”, with a diameter range of 1/4” to 2”. Our variable speed drive operates up to 50 FPM with a 1” silent chain or non-marking belt. Conveys rotors to the workrest of a Cincinnati Model 340-20 Centerless Grinder.